This class is responsible for rendering the HTML that will be returned to the browser when an unhandled exception occurs within your application (Server error 500). It loads and processes IntraWeb's standard error template. It is also used to display session timeout exceptions to the user. Unhandled exceptions also contain the application stack trace, when available, and most informations generated by the TIWExceptionLogger class. When the request is local (originated from localhost), the standard error page contains all information generated by TIWExceptionLogger, otherwise only a subset of the information is rendered. This class only has class methods and class vars, and should not be instantiated. Users may override it and register this new class using SetExceptionRendererClass. 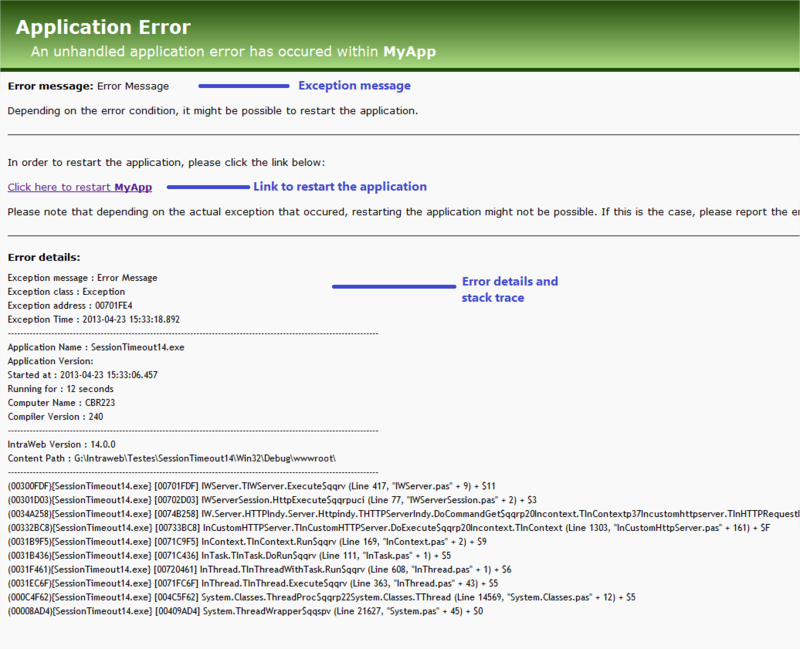 Description: Set the colors used by the default HTML template, used by IntraWeb, when an unhandled exception occurs. Description: Register a new TIWExceptionRendererClass to be used by the IntraWeb application.